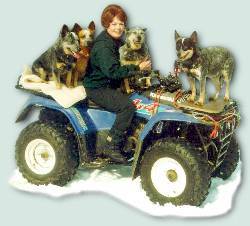 TaliHO has been breeding, training and exhibiting champion herding and working breed dogs for over 45 years. The owner of TaliHO grew up in the Great Plaines in an agricultural family who breeds, raises, trains and exhibits champion dogs, American Quarter horses and cattle. Her involvement with breeding, raising, training and exhibiting dogs and horses began at a very young age and has continued to be an integral part of her life. TaliHO has many American Kennel Club (AKC) and Canadian Kennel Club (CKC) and United Kennel Club (UKC) conformation champions, obedience titled dogs, therapy dogs, and dogs that have participated in other canine venues such as agility, sled dog racing, etc. TaliHO is confident in our quality-breeding program. We guarantee our dogs and puppies for soundness against genetic conditions with written contracts. We breed selectively and limit the number of dogs we breed. It is our goal to produce “quality dogs” not “a quantity of dogs”. It is TaliHO’s desire that the dogs and puppies we offer for adoption will have lifetime, loving homes. TaliHO offers extended pedigrees and proof of genetic testing to the families that have adopted our dogs and puppies and written assurance for 100% satisfaction. The goal of TaliHO has been to breed to the AKC Breed Standard the highest quality dog of its breed, train and exhibit the dog in the various canine venues for which the dog breed is bred to perform. It is the goal of TaliHO to produce “quality dogs” not “a quantity of dogs”. To achieve this goal TaliHO has spent considerable time researching and studying the genetics of the herding and working breeds in an effort to breed quality dogs, which are genetically sound. It is a fact that most purebred dogs have some genetic conditions as is stated and supported by research and detailed in the book, Control of Canine Genetic Diseases, by the late Dr. George A. Padgett, DVM, Professor Emeritus of Pathology at Michigan State University. Dr. Padgett was one of the world’s most celebrated researchers, writers and lecturers on the subject of canine genetic diseases and his contribution to the breeding of genetically sound dogs is unparalleled. It was a pleasure to have known him. TaliHO has researched and studied generic conditions in the Australian Cattledog in an effort to track and determine the existence and probability of these conditions in its breeding program and endeavor to breed away from them. Medical testing, x-rays, studying OFA and CERF record and studying and knowing bloodlines of the Australian Cattledog breed can aid in tracking the occurrence of genetic conditions. DEAFNESS a hereditary genetic condition. It is determined by administering a BAER Test to the dog or puppy and is done at a veterinary clinic which has special equipment to administer the test. A report of the test is generated for the veterinarian and owner that will show the level of hearing in each of the dog’s ears. A dog or puppy can be totally deaf, partially deaf known as unilateral hearing or have complete hearing known as bilateral hearing. For more detail on hearing visit the Purdue University website. DYSPLASIA a hereditary genetic condition. Its presence and the degree of dysphasia in hips and elbows is determined by having x-rays done of the dog’s elbows and hips at a veterinary clinic. Dogs should be 2 years of age for a valid test result. The x-rays are forwarded by the veterinary clinic to the Orthopedic Foundation for Animals (OFA) for evaluation. OFA will issue a document stating the determination they have made of the x-ray as it relates to Dysplasia. BLINDNESS a hereditary genetic condition. As it relates to Progressive Retinal Atrophy (PRA) late onset is tested by having a blood sample drawn at a veterinary clinic, packaging it correctly and forwarding it to Optigen at Cornell University for evaluation. Optigen will determine whether the dog has PRA (Pattern C), is a carrier for PRA (Pattern B) or does not have PRA (Pattern A). Optigen will issue a document stating their determination. For further information about PRA, an understanding of the testing and evaluation see the Optigen website www.optigen.com. Other diseases of the eyes are diagnosed by an eye examination performed by a Certified Canine Veterinary Optomologist. What the veterinary sees is recorded on a Canine Eye Registration Form which is forwarded to the Canine Eye Registration Foundation (CERF) for evaluation. This CERF Exam as it is known is valid for 12 months from the date of the exam. The certification relates to Phenotype (appearance) only at the time of the examination. It implies no clearance for Genotype (possible “carrier”) or heritable ocular disease development subsequent to the date of the examination. A CERF Exam is not a substitute for a blood test for Progressive Retinal Atrophy. Epilepsy and Heart conditions occur in certain bloodlines. 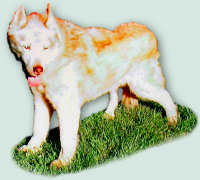 The probability of these genetic conditions can be determined by studying and understanding bloodlines. Bloodlines appear in the dog’s extended pedigree. TaliHO evaluates all of its dogs and puppies for known genetic conditions and its breeding stock is as genetically sound as possible. Study and years of experience has proven to us that a well balanced nutritional canine diet is important to quality, healthy, high performing, long lived dogs.healthy, high performing, long lived dogs. We have had working breeds whose normal life expectancy is 10-12 years old live to be 17 years old. We attribute this long life to feeding quality foods and supplements as needed for each dog and providing excellent medical care. There was a recent article in the Journal of Veterinary Medicine that addressed the feeding of raw diets for dogs. Stated simply the article said that raw diets are not a nutritionally balanced diet for dogs. When you do not feed a nutritionally balanced canine diet dogs will not have the nutrition to grow and develop to their fullest capability. Poor nutrition manifests itself throughout the life of the dog with fertility problems, internal organ function problems, skin problems, temperament problems and a host of other medical conditions. Appropriate and timely medical attention and care are factors in quality-bred dogs. Preventive medical attention with vaccines, testing, exams and close observation are important to the health and quality life of dogs. 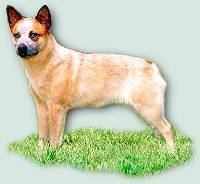 Australian Cattledog Club of America. (Past North Central Regional Director). If you have questions about the breed, feel free to email TaliHO by clicking on and we will be happy to answer your questions.